On Thursday, April 11th, the Walt Disney Co. announced the news of its upcoming launch of the Disney+ streaming service. The rival streaming service is set to launch on November 12 of this year at $7 a month or $70 a year, which undercuts Netflix’s most popular U.S. plan at $11 a month. Taking a short term loss in cost, Disney will lose the easy money that came with Netflix licensing deals so that Disney, Marvel and Lucasfilm content becomes Disney+ exclusive. 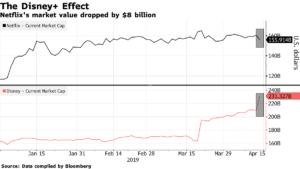 Netflix shares fell as much as 5 percent to $349.36 shortly after the open in New York Friday, sending its market as low as $152.5 billion. Disney went the opposite way. Its shares jumped to a record high, adding as much as $25 billion in market value, for a total of about $235 billion.